We are happy to announce you a special pandeiro event at our 2017 festival stall in Coburg! Several times a day, Matthias Haffner from HP Percussion will be at our festival shop and show off his amazing pandeiros skills, answer all your questions and show you some tricks. For stage players and professionals - he will also show those interested the best microphoning techniques and some suitable equipment. For exact times please check with our festival crew. 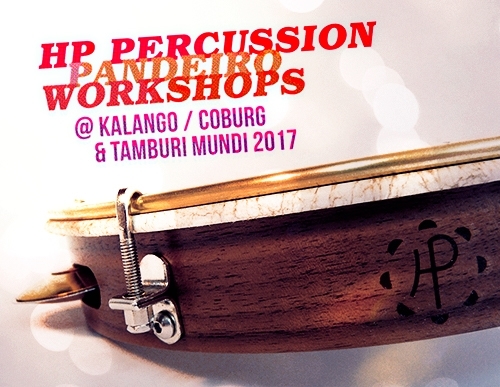 If you can't get enough from playing the pandeiro and haven't got any plans yet between 31.7. and 1.8.2017, you may look forward to a pandeiro-intensive weekend in Fribourg, Germany! Once again the pretty town in the beautiful Black Forest region invites musicians and percussionists to a top quality musical weekend with a large diversity of teachers. In this multi course, Matthias will present several playing techniques which he has learnt from master players all over Brazil. The workshop aims at passing on these techniques to you in order to comfortably apply the for the arrangements Matthias has especially prepared for the workshop. The compositions are made for multiple voices and are therewith suitable for any level from the beginner to the expert. Matthias is refreshingly experienced and creative on his instrument and will find the right amount of teaching material according to the needs of each player. His teaching range goes from traditional to modern rhythms as well as including related frame drums which will also be played in this workshop. Matthias Haffner has developed his own pandeiro lines together with Anders Perander under the name of HP Percussion. They themselves build all their instruments by hand including hammering the jingles and designing new sound spectrums. 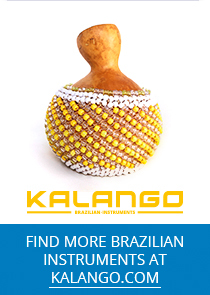 Amongst pandeiristas, they are now internationally known as one of the top brands for high-end pandeiros.